Family, fitness and faith are all at the center of my being. I was a caregiver for 13 years for two of the most important men in my life – my fathers. Like many caregivers, I experienced the joy and heartbreak of caring for my parents. It was a journey that sometimes made me laugh and sometimes made me cry. When my father was diagnosed with dementia after suffering from two strokes, I was concerned about his quality of life, so I moved him into my home and hired nurse assistants to help me take care of him. Eventually, God sent me an angel named Lenell Wyatt who moved into my home and took care of my Papa as if he was her Papa. It was a blessing to have Dad at home with me. We had a beautiful relationship. Every morning it was like waking up to sunshine. There were many ways dementia changed my Dad, but I made sure he was always physically, mentally and spiritually stimulated. To help him develop a new norm, I took measures to focus on his wellness daily. We kept busy with senior church programs, bingo and movie nights, field trips, aquatics, art classes and tennis. We also had date nights once a week. Papa loved to go salsa dancing…well, he stood in one place snapping his fingers while the pretty girls danced around him. Every single day was full of these sunny moments. I believe everyone can live their best life, and this includes people with dementia and Alzheimer’s – and their caregivers. With more than 25 years in the fitness business, I have seen firsthand how having a purpose, the right mindset and setting goals can help create change. To continue the legacy of my father, I’m educating, inspiring and empowering people about dementia, whether it’s about caregiving, the emotions that come along with the disease or the financial impact it has on families. I would like to support families who have loved ones living with this disease and keep the lines of communication open so that other people don’t feel alone in their fight. That is why I am walking in Walk to End Alzheimer’s this year. My Dad passed away last June. I put my head on his belly, and saw him take his last breath. He was surrounded by those that he loved, and he was ushered into glory with the lead singer from the praise and worship team singing “Amazing Grace” and “Precious Lord.” It was the greatest honor to take care of him and he lived his best life. For my Papa and millions of others like him, I continue to work to make sure my story is heard. I know my passion and purpose is to connect with families and friends at Walk to motivate and reach their souls! Our shared goal is a world without Alzheimer’s. Let’s put strategies in place to make that happen. Let’s walk. About the Author: Donna Richardson is an international lifestyle and fitness expert, author and talk show host. She has starred in award-winning videos for Nike, ESPN and Beachbody, the best-selling “Buns of Steel” and now her own “Old School Dance Party Workout.” She has served on the Women’s Sports Foundation Board, the LPGA Foundation Board, the Robert Wood Johnson Foundation Board and as an Advisory Board Member for the Boys and Girls Clubs of America. She is an Ambassador for the “Let’s Move” initiative, has taught at the Oprah Winfrey Leadership Academy for girls and is the founder of Grow Green Get Fit, a nutritional, physical and environmental curriculum for school-aged children taught at YMCAs across the country. Donna is the only member to serve on both President Obama’s and President Bush’s Council on Fitness, Sports & Nutrition (PCFSN). She was inducted into the Fitness Hall of Fame and named “One of the Most Inspirational Women in America” by Essence Magazine. Join her at the Walk in Dallas, Texas. She was, and she is. But the challenge, I came to see, was just as formidable for me as it was for her. I don’t mean to sound cavalier here. Any of us, given a choice between having Alzheimer’s and caring for someone who does, would choose the caregiver role. I know that. I don’t ever minimize what B. faces every day, and how that challenge grows. But being a caregiver is hard. It is definitely the hardest thing I’ve ever done in my life. Growing up in Bed-Stuy at the time I did, breaking out of what was one of New York’s toughest inner-city neighborhoods, finding jobs as a very black man in a white man’s world — that was easy compared to taking care of a wife with Alzheimer’s, day by day, hour by hour. Here are a few helpful suggestions I’ve learned through experience. Read the literature. I know that sounds obvious, but the fact is that most caregivers read very little. For one thing, they’re occupied with caring for their loved one. I get it! But frankly, most feel they’ve done enough by just listening to what their doctor tells them. They really haven’t. There’s so much to learn in terms of diet, activity, ways of coping . . . I think you can get a lot of that from our book, but I’d urge you not to stop there. Knowledge helps. It helps your loved one, and it helps you, with specific suggestions on what to do and what not to do. Learn as much as you can about the disease. Maybe this seems like extra homework, but I got fascinated by learning the science of what Alzheimer’s is. I found it oddly comforting to know what doctors have figured out so far—more so to learn what the paths are to a possible cure. Get in touch with your local branch of the Alzheimer’s Association. There are many wonderful organizations out there, from those promoting research and drug trials to commonsense help for caregivers, and we list a number of them in our book. But the national Alzheimer’s Association is in a class by itself—a fount of information, with an unequaled network of local branches to offer all kinds of hands-on help. In groups of three or more, don’t treat your loved one as if she doesn’t exist, and don’t refer to her in the third person. The most loving and well-intentioned caregiver can find himself icing his loved one out of the conversation—with her sitting right beside him. It’s understandable, especially if the disease has progressed to the point where the patient has lost all ability to follow the conversational thread. But even severely impaired patients tend to sense when they’re being excluded— I’d put that more in the spiritual than scientific realm—and to feel hurt and humiliated as a result. Visit bsmith.com to learn more about the book Before I Forget. Don’t try to finish a loved one’s sentences. Give her time to respond. If she can’t retrieve her thought after a long pause, gently prompt her with what you think she’s trying to say. When this started with B., I made the classic mistake of letting my frustrations get the better of me. B. would let a sentence trail off into space, and I’d jump in to finish it for her. As soon as I knew what she was trying to say, I’d go there first. I still get impatient—I’m only human—but I’ve gotten a lot better at letting B. take the time she needs. I try to be zen-like about it. I mean, after all, what’s the hurry? Avoid being condescending or critical at all costs. It’s debilitating and simply doesn’t work. I tell you this from bitter experience. Before Alzheimer’s, B. and I never— ever—argued. Frankly, that wasn’t because we were both so level-headed. It was that B. was! I was the one with a temper; B. was just gracious enough to keep me calm. When her Alzheimer’s came on, B. was still calm—but I no longer was. I was mad—at fate, and yes, too often, mad at B. Slowly, I got over that and came to terms with the obvious. Alzheimer’s wasn’t B.’s fault, and my lashing out at her—when she forgot something I told her ten minutes before— was of no help or justification whatsoever. Here’s one thing that helped me: I started consciously keeping my conversation with B. to questions that could be answered “yes” or “no.” Instead of “What would you like to wear today?” I’d say “How about these black pants?” In the supermarket, same thing. Not “What shall we have for dinner tonight?” but rather “How about this salmon? With a little salad?” It made for a much happier B. She could participate in the decision and not feel left out—or, worse, hurt by a snappish remark from me. Above all, never lose sight of the dignity within the human being who has the disease. This is so, so critical. Maybe it’s the most critical point of all. Patients get worse with Alzheimer’s—so far, that’s the unavoidable truth, without exception. As they do, they lose physical mobility along with their functioning minds. This is a terrible, terrible process for them—and for those who love and care for them. But even those with severe Alzheimer’s retain their humanity and remain, somewhere inside, the people we knew. We have to honor that, always, even to the last, both for their sakes and ours. About the Author: Dan Gasby is husband and care partner to supermodel, restaurateur, magazine publisher, celebrity chef, and nationally known lifestyle maven B. Smith, who has younger-onset Alzheimer’s. Dan has been a television media sales executive and a television producer for both network and syndicated programs. He helped publish and launch wife B’s eponymous magazine and helped cofound her lifestyle retail brand. In April 2013, Vern Gillmore was diagnosed with early-stage Alzheimer’s disease. When Vern first started to experience the warning signs, he was not prepared to hear the words “Alzheimer’s disease.” Today Vern and his wife and care partner Karen are working together to educate others about the disease while facing their daily challenges head-on. They are just one couple whose story shows the power of love and teamwork during National Alzheimer’s Disease Awareness Month. I have been athletic all my life. I couldn’t accept not having a healthy body. I’ve always prided myself on physical fitness and staying in good health, and suddenly I had anxiety and double vision and difficulty using familiar devices like the home computer. I was a volunteer in disaster response, and when you work in those situations, you have to be able to make quick decisions. I volunteered during Hurricane Sandy in New York and realized when I returned home that I wasn’t as quick or alert as I should have been. I didn’t want to hurt people who were suffering by making a bad decision – that would have torn my heart out. I realized something was wrong with me. My mother and brother had Alzheimer’s, but I was in denial that the cause of my symptoms could be the same. I have accepted that I have Alzheimer’s. I handle my frustrations by keeping busy. I love taking my dog outside, running her hard for an hour and see her enjoy the exercise as much as I do. Her happy wagging tail makes me happy. At first I didn’t want to share my diagnosis with others. I was embarrassed and ashamed. But then I realized that I didn’t do anything wrong to cause this diagnosis. Things have changed since my diagnosis. I now look forward to being able to talk openly about my Alzheimer’s. I now speak at churches, city centers and hospitals in my area because I know that many people are uninformed and that the general population needs to understand and learn more about Alzheimer’s disease. My wife Karen is my care partner. She is observant and sharp. She doesn’t miss a beat. She is why I was able to get back to what matters: I volunteer, participate in the Walk to End Alzheimer’s, and stay involved in whatever capacity I can. Vern and I met through a newspaper advertisement in the San Francisco Chronicle during the ’90s. We were married for 20 years before the Alzheimer’s diagnosis. I am the worrier in the family, vigilant 24/7. On a typical day, I manage our schedules and instill safe habits. Vern sets up his medications and I double-check them. I ask him the important questions before he goes out: do you have your wallet? Keys? Phone? GPS? We keep a list of phone numbers available should he become confused or need help when he goes out. I have found the Alzheimer’s Association website alz.org to be a gold mine. 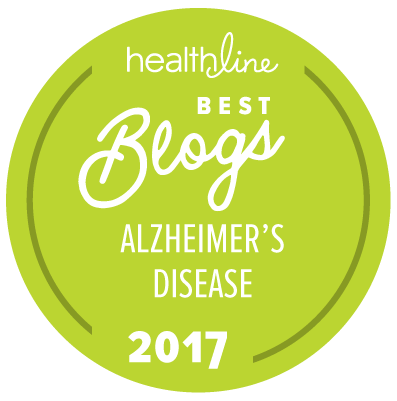 It is simple – there is so much information on Alzheimer’s disease and it’s easy to read and understand. I chip away at the website, read books, and subscribe to neurology journals. I think it is important for care partners and caregivers to know that it doesn’t make you a bad person when you experience frustrations. One of the biggest challenges I have come across is the changed communication style between Vern and I. It takes a lot of energy and never-ending patience to not take things he says or does personally. When we went to a support group, it was the first time I didn’t feel all alone anymore. Everything I had been thinking and feeling was validated. Other people were experiencing the same emotions I was. I talked to people who were at the same place I was as a care partner and it gave me a renewed sense of energy. Vern has renewed energy as well; he is now very interested in educating people about the disease as an Alzheimer’s Association National Early-Stage Advisor. He never really had a hobby other than running, and volunteering; but he has one now. His hobby remains volunteering, but he has added talking about Alzheimer’s and educating the public about how this disease impacts individuals and families. Vern and Karen’s story continues. And they are not alone. In 2013, 15.5 million family and friends provided 17.7 billion hours of unpaid care to those with Alzheimer’s and other dementias – care valued at $220.2 billion. More than 60 percent of those Alzheimer’s and dementia caregivers and care partners are women. Karen is just one of millions who found resources that have helped her on her journey as a care partner. Vern Gillmore is a member of the Alzheimer’s Association 2014 National Early-Stage Advisory Group (ESAG) and is actively involved with the Utah Chapter of the Alzheimer’s Association. As an Advisor, Vern shares his story to raise awareness about Alzheimer’s and help reduce the stigma attached to the disease. Volunteers – both with and without Alzheimer’s disease – are needed to participate in actively enrolling clinical trials about Alzheimer’s and related dementias. Recruiting and retaining trial participants is one of the greatest obstacles to developing the next generation of treatments and possibly future cures for Alzheimer’s and other dementias. TrialMatch® is a free matching service that connects individuals with Alzheimer’s and other dementias, caregivers, healthy volunteers and physicians with current clinical studies. With a database of 130+ Alzheimer’s clinical trials, including both pharmacological (drug) and non-pharmacological (non-drug) studies being conducted across the country, TrialMatch is a unique opportunity to make a difference in your life and the life of others with Alzheimer’s disease. The Alzheimer’s Association spoke with TrialMatch user Wanda Young regarding the benefits of her participation in these clinical studies. Wanda is caregiver for her husband, mother and brother, all of which have forms of dementia. She is participating in clinical trials as a healthy volunteer. Wanda Young has been married to her husband Lou, a former teacher, mentor and coach for nearly 30 years. They have two wonderful sons. Wanda participated in the Medications Assistance study and the Relationship between Chronic Stressors and Eating Behaviors in Dementia Family Caregivers study through the Alzheimer’s Association’s TrialMatch® program. She is the primary caregiver for her husband, her mother and her brother. During Black History Month, the Alzheimer’s Association spoke with Dr. Monica Parker, an African-American family physician, caregiver and assistant professor of medicine about her passion for providing communities with local resources. The theme throughout all of her research and work in the field is simple: Education. Board certified since 1990, Dr. Parker has practiced primary care and geriatric medicine in rural Georgia and urban Atlanta. Since 1995, she has been practicing with Emory Healthcare, often speaking on the importance of Alzheimer’s education. Dr. Parker has witnessed firsthand what needs to be done to get black communities involved in research through clinical trials. Dr. Parker stresses that education is key. She noticed that most of her upper-middle class white patients were being screened every year as part of a clinical research study at Emory’s Wesley Woods Center, and learning about better lifestyle habits. She knew that these same habits needed to be created and maintained in black communities. Since 2010, Dr. Parker and her team have developed community forums, funded in part and supported by the Alzheimer’s Association, to inform about the Emory Alzheimer’s Disease Research Center and ongoing clinical studies. These studies have included an African-American Caregiver study, a study about normal women’s aging, and a cerebrospinal fluid (CSF) biomarker study comparing CSF of Caucasians and African Americans with family histories of Alzheimer’s disease. Dr. Parker and the Emory Alzheimer’s Disease Research Center (ADRC) have established these educational forums as one strategy that serves as an excellent mechanism for recruitment of volunteers for clinical studies. According to Dr. Parker, many of the participants in the COOL-AD African-American Caregiver Education study in the Emory School of Nursing study viewed their participation as an opportunity for getting assistance and as a “service” provided by Emory – not simply as research. One of the biggest and most immediate concerns still surrounding African-American research is the establishment of a national brain registry. The Emory Alzheimer’s Disease Research Center has had four African American families donate the brains of loved ones for the study of Alzheimer’s Disease in the last two years. These persons were active research participants before their deaths. This provided an opportunity to learn about their disease trajectory. The brain autopsy is important because the dementia observed may have a different pathologic origin in this population. Dr. Parker has a passion for this work, but she also knows that the decision to donate the brain of a parent or loved one is a difficult decision. Whether a person chooses to donate their brain for research or not, the more information provided to communities about the long-term value of these studies will result in more trials, further research and a possible cure that will secure the health of future generations. Monica W. Parker, M.D., is an Assistant Professor of Medicine in the Division of Geriatrics and Gerontology at Emory University. Dr. Parker participates in a biyearly lecture series funded by the Georgia chapter of the Alzheimer’s Association. Dr. Parker received a National Institute of Health (NIH) Minority Supplement award to study dementia in ethnic persons in the Emory Alzheimer’s Disease Research Center (ADRC). She also takes her lectures on the road through the Registry for Remembrance, an academic community partnership that helps educate and recruit African-Americans for long term research participation at the ADRC. She is currently a Co-PI on a 3.5 million dollar grant awarded to Emory School of Nursing by the NIH – National Institute of Nursing Research (NINR).